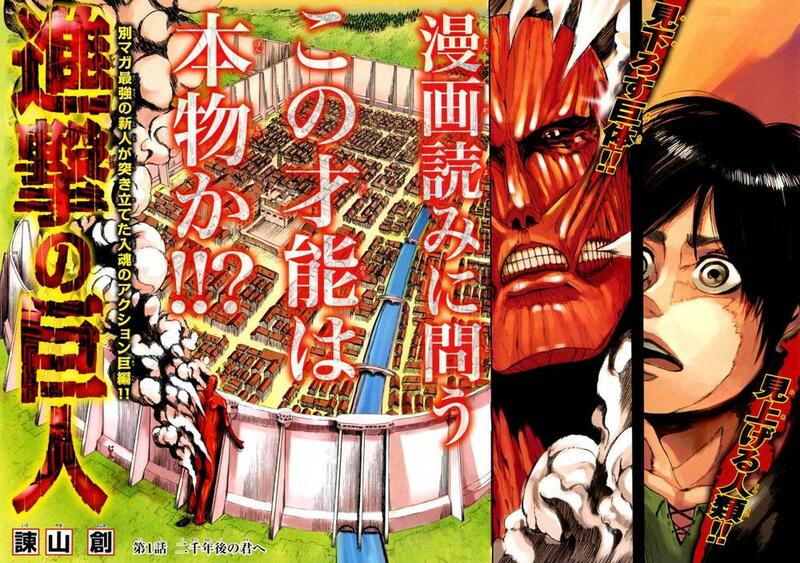 To You, 2000 Years From Now (二千年後の君へ Ni-sen nen-go no Kimi e) is the 1st chapter of the 1st volume and the 1st chapter overall of the Attack on Titan manga. And what is the significance of bringing up a timeline 2000 years from now? One thing that is bugging me that the chapter, volume and manga starts with Eren waking up fro a dream, crying and exclaiming that Mikasa's hair has grown longer? 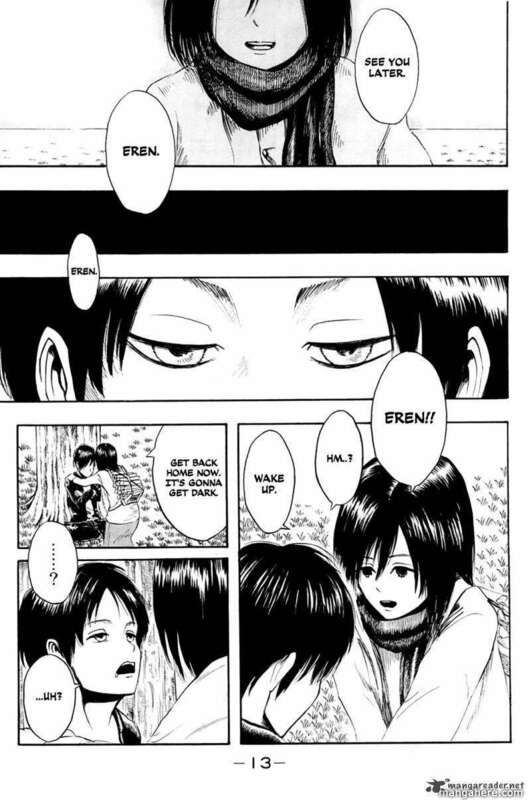 Meanwhile, Eren Yeager is having a dream about an older version of his close friend, Mikasa, bidding him goodbye. He is promptly woken up by the real Mikasa, who insists that he is been sleeping for a while. 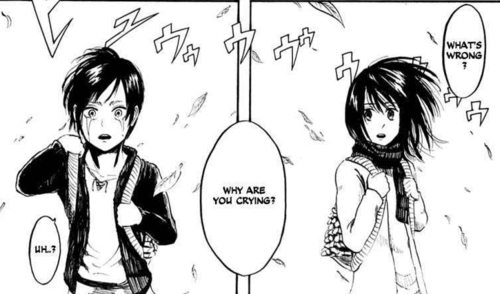 As the two return to their village, Eren begins crying, but when Mikasa asks why, he does not give an answer. Please do not read if you are not up to date with the manga (latest chapter being 91). The you might be the future inheritor of the 'Attack Titan' power. Also keep in mind that there is no official answer, thus the correct answer (for now) would be "We don't know". However, after discussing on some forums and reading some theories, some hints provide a common direction. 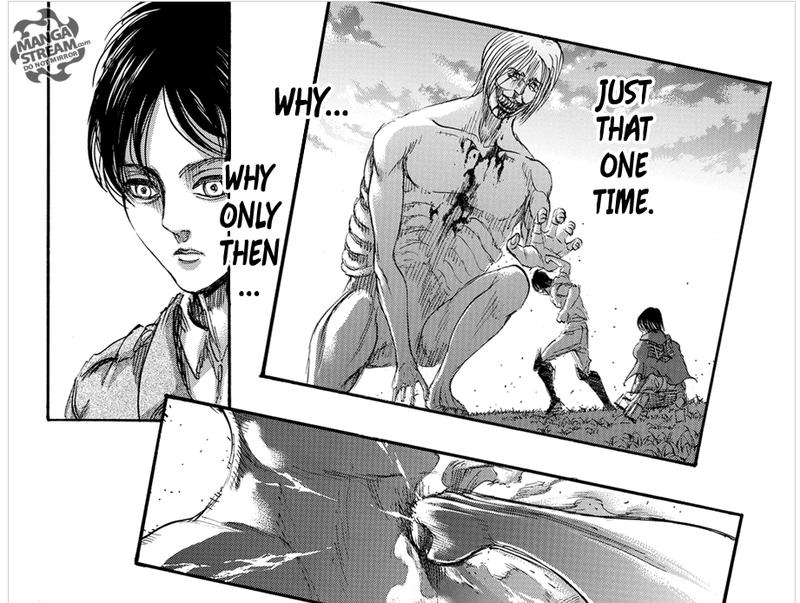 As we know, Eren obtained the power of the Attack Titan with the Coordinate Titan (also known as the Progenitor Titan) from his father, Grisha Jaeger. Ever since, he has been having certain "visions", or "memories" especially while fighting other titans. In the manga chapter 89, this becomes clear. SPOILERS!! Images from manga chapter 89. Which brings us to the second hint of this chapter. 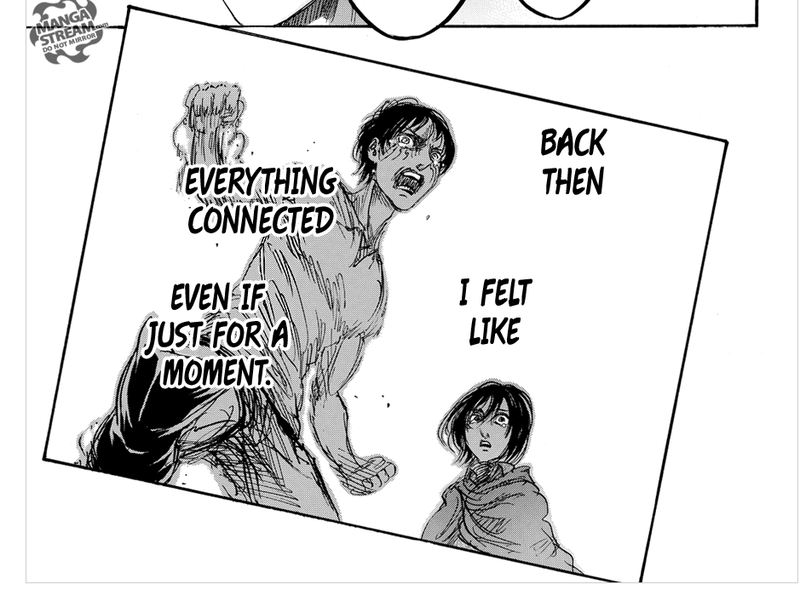 Eren recalls the time he was able to use the Coordinate Titan's power. SPOILERS! If you have not read chapters 87 and above, do not read further! There exists a memory-timeline that is outside of our perception of time. That is, Eldians who have obtained (at least) one of the 9 original Titan's power, have access to the memory-timeline of all previous (and possibly future) Eldians who obtained the same power!! In simple terms, Eren has the 'Attack Titan' power and the 'Coordinate Titan' power. He is able to access his father's memories, and either alter them or combine them with his own memories. Thus, the you in the first chapter, might be the future inheritor of the 'Attack Titan' power. As stated above, this is all speculation because nothing is revealed yet. The anime itself don't have an official answer. I searched it and there's a bunch of threads from months/years ago discussing what this title of the first chapter/episode means with wild theories. A letter written by someone for someone or something. Armin, the narrator, to humanity or Eren, perhaps? Eren's fate. 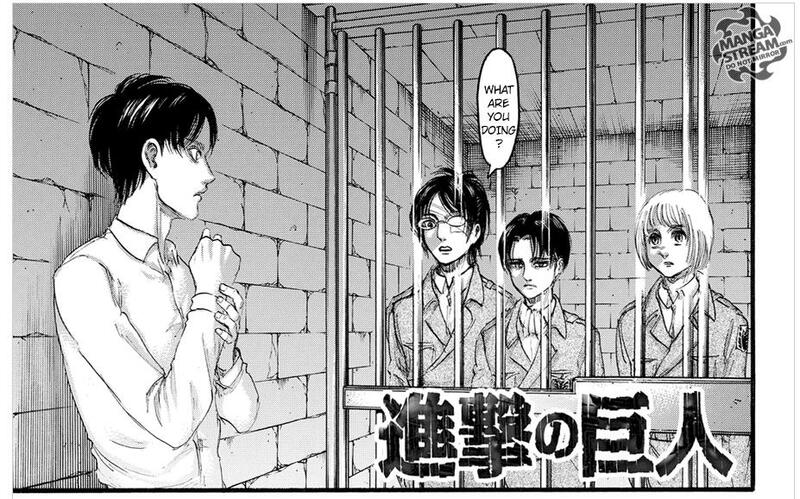 Maybe the "See you later, Eren" thing is right before he, say, gets trapped in a crystal or put in some sort of home-made titan time machine thing. Is a thought someone had. Maybe whoever was the first king or something, even Ymir? Let's talk about chapter 88 for a second, shall we? 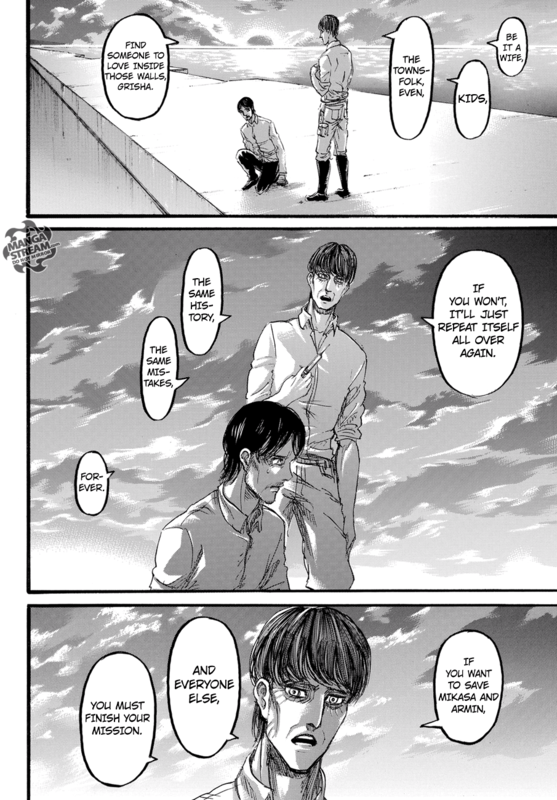 Eren Kruger tells Grisha Jaeger to protect Armin and Mikasa, well, a theory I think can fit this question stems to this point. So, Eren dies and when he does, his memories are transferred to Eren Kruger due to him being his predecessor. The story is based off of Norse mythology, they believe there is nothing such as the future and that it's only a repeated cycle of the past. Say we have a universe of timelines, one universe of you is dying and the other of you is being born so there is no such thing as the future, it's a constant cycle of the past. There are infinite universes of you and every second of you, the moment you were born is replayed while you dying is also being replayed. They also believed that when a person is dead, he would be sent to the world tree where he'll be born again through another root of the tree in another family as a different being. They believed that the actions of the new life of a guy will be influenced by his past life. So destiny is unchangeable. It's influenced by the being her or himself or his or her surroundings. 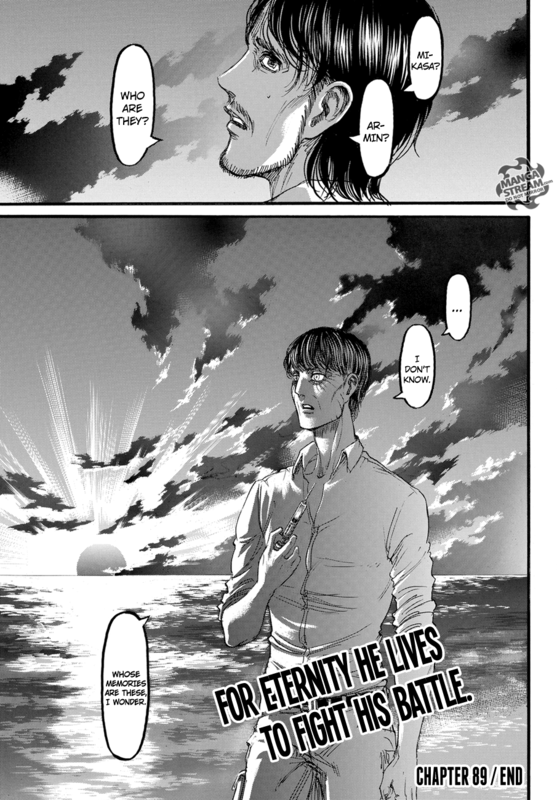 SO basically Eren Kruger is reborn as Eren Jaeger and will die to sacrifice himself to another person to be eaten up. Now, in 2,000 years a major event will occur in Eldia and Eren may have had a dream about that so he's trying to warn the people 2,000 years later about it or something along those lines. His ancestor must've warned him about it. Probably that very own ancestor will share the same fate. Armin seems to be narrating everything so this is probably in his point of view if that is the case he might've just been recording these events to ensure that Eldia will not perish a century later. Eren must've told him about it so he's just living on Eren's stories just to ensure his dream is fulfilled. The dream he saw in the first episode may provide some foreshadowing.